The Howe No. 1 quarry, designated by Stugard (1958) as pegmatite 73, is one of the three largest quarries in the entire Middletown-Portland district. It is 200 yards south of P5 through the woods. 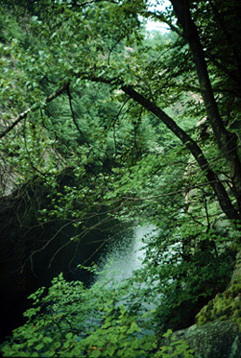 The dumps are clearly visible through the surrounding foliage. The quarry was originally opened by George S. Andrews around 1866. The quarried feldspar was hauled by ox teams on a road specifically built for the purpose (called Old Maids Lane after the spinster Tryon sisters who lived there) to Andrews dock on the Connecticut River. The northern part of the quarry was sold in 1880 to Joshua and William P. Huspband (note unique spelling, McNulty 1995), and at that time the southern part was leased to Charles Hall. Quarrying occurred in both the northern and southern sections, but it was noted that the southern zone contained higher quality feldspar. The Huspband brothers bought the old Hollister Grist Mill, on High Street at Roaring Brook, and converted it into a grinding mill for processing the feldspar mined in his quarries. In 1905 Louis Howe acquired the entire property, including a spar mill and he produced 65,000-70,000 tons of feldspar between 1906 and 1928. Howe was a successful local merchant, owning, among other things, a local water company that supplied part of the town with water from his reservoir on Evergreen Lane near Chestnut Hill. 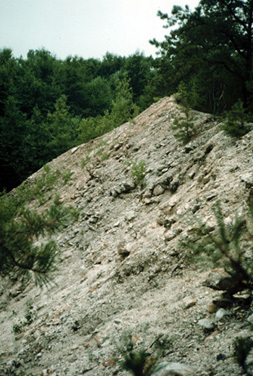 Under Howes ownership, his quarries became the largest feldspar supplier in Connecticut (McNulty, 1995). 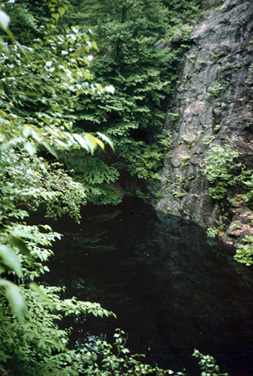 The quarry has been inactive since 1928. At that time ground water flowed in at 300 gallons per minute and pumping costs made the operation unprofitable. For a period Vespa Stone Products, excavated the dumps (fig. 11) selling it as crushed stone. The high muscovite content made it unacceptable for construction and dump excavation has ceased. In recent history, the Howe No. 1 quarry was sold in 1973 by the International Minerals & Chemicals Corp to Joseph L. Robert, who then sold to Alan & Janice Wasserman in 1975 and now is owned by the Wasserman family trust to be maintained as open land. Larry Wasserman (eluu400[at]att.net) lives in the family home overlooking the quarry, and he should be contacted for permission to collect at the quarry and on the quarry dumps. Figure 11 - Recent excavation for road fill at the westernmost dumps at the Howe No. 1 quarry. The pile at the left has been crushed to one inch average size. Figure 12 - View from above Howe No. 1 quarry looking south into the water filled pit. The Howe No. 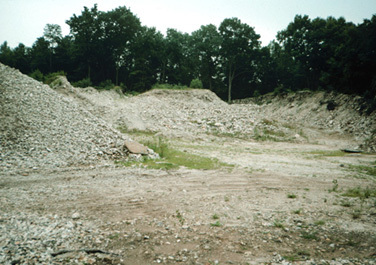 1 open cut is an enormous excavation when compared to most Connecticut quarries. The water filled pit is 100 feet wide and 800 feet long (figs. 12 and 13). The dumps cover an extensive area west and southwest of the open cut and tower over 120 feet high above the surrounding landscape. The dumps contain an estimated 600,00 tons of excavated pegmatite. Two powder magazines are still standing. These and the water filled pit are the only features marked on the USGS topographic map of the Glastonbury Quadrangle. Figure 13 - View looking northeast into the water filled Howe No. 1 quarry. Figure 14 - Southern extent of the dumps at Howe No. 1 quarry. Dumps are exposed down slope for 120 feet. Top of dumps are overgrown with young saplings. The quarry employed thirty to sixty men operating steam drills and fifteen to twenty five men in the grinding mill. Production peaked in 1907 at 8,300 tons. The feldspar was hand-separated to eliminate sodium feldspar, quartz and all visible fragments of muscovite, beryl, and tourmaline. 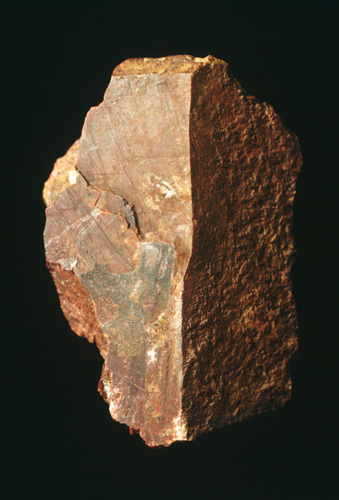 One-fourth of the quarried rock was recovered as salable feldspar. The feldspar was ground on-site to 60 or 80 mesh and then shipped for use in manufacturing bathroom fixtures and porcelain insulators. Some 200 mesh feldspar was also sold for use as scrubbing compounds such as Bon Ami. Yellow-green beryl crystals, as large as 6 inches in diameter, were reported by the workers. These were all sent to the mine dumps. Mineral collectors found many beryl crystals here in 1996, the largest of which is 5 inches long and 2.5 inches in diameter. Figure 15 - Molybdenite in albite collected by Professor W. N. Rice at the Howe No. 1 quarry in 1920. Wesleyan University Natural History Museum Collection No. 10665. Figure 16 - Columbite one half inch long in albite, collected by Hurlburt in 1906 in South Glastonbury, Connecticut. Peabody Museum of Natural History, Yale University Specimen 1784-3. Photo by William Sacco. Rare minerals can be found here too. 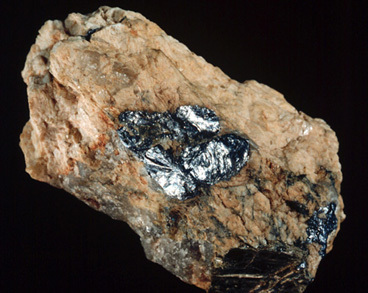 Molybdenite up to one inch crystals can be found embedded in albite (Fig. 15). 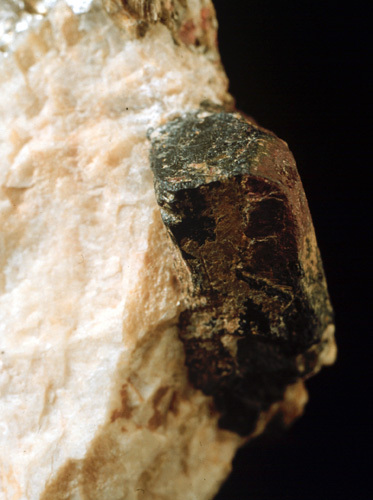 Columbite-tantalite in masses and crystals up to .5 inch (Fig. 16) and grass-green torbernite as dense flakes coating surfaces between pegmatite minerals, are known. Also found are almandine, autunite, manganapatite, monazite (Fig. 17). The promising mineralogy, newly exposed dumps, and the size of the dumps at the Howe No. 1 quarry make this location especially attractive for mineral collecting. Figure 17 - Partial crystal of monazite, collected by Hurlburt in 1906 in South Glastonbury, Connecticut. Peabody Museum of Natural History, Yale University Specimen 1911-111. Photo by William Sacco. DO NOT CALL THE OWNER OF THIS WEB SITE REQUESTING PERMISSION OR MORE INFORMATION. EVERYHTING KNOWN IS PRESENTED HERE ON THE PAGE.